Do you always need a high end tripod to shoot great video with a DSLR? Conventional wisdom says that you need a stable tripod with a smooth fluid head for shooting professional video. And that’s what I recommended in the Buyer’s Guide. But Rodney Charters, DP for the Fox series “24”, in a recent interview on ProVideo Coalition had this to say about shooting with DSLR cameras. Check Philip Blooms videos and you’ll see that most of the shots are static. If the camera is moving it most often is mounted on a slider. Sometimes you’ll see a smooth, slow pan. So, why would you spend hundreds (maybe thousands) of dollars buying a high-end fluid head then just “park the camera”? I’ve found your guide and website very helpful already. I did have one question, though, that I hope you could perhaps help with. I’m preparing a line of guitar lessons to be sold online and I need to add some video guides. Digital audio is my strength, and I’m only learning how to speak the video language. Your buying guide and website have confirmed that the Canon T2i is likely the best camera for me. Fortunately for me it’s under $1,000, because I actually need two of them (one for each playing hand at different angles). You also confirmed that a Sennheiser lavalier and Zoom H4N were the best ways of capturing audio. So far, my instincts have proven to be good ones. However, I am on a relatively limited budget, and I don’t think there’s any way my boss (i.e. my wife) will let me spring for $1,500 for a couple of the Manfrotto tripod stands your eBook recommends. She’s onboard with the cameras, Final Cut Studio (we already have a couple of good Macs), a $700 lighting kit, but I think a grand and a half for tripods would put her (and our budget) over the edge. I’m running out of money, and I haven’t even shot a single frame yet! Regarding my needs, please know that the tripod will be used only for indoor use and no panning or the like will be involved. The tripods will be set up once and remain stationary during the entire shoot, so the “glide” and ability to remain stable during hurricane force winds are not a factor. It needs to be stable for light indoor use, but still high quality. It’s clear that Scott would be wasting good money on high-end tripods. After reading Rodney Charters’ interview, I think most people need a better way to shoot solid DSLR video than the conventional fluid head video tripod. 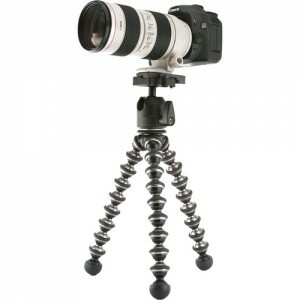 The Jobi GorillaPod Focus and Ballhead bundle is a heavy duty flexible table-top tripod. You can wrap the legs around most anything if you take it on location. I have a couple of sizes and use them all the time. You need the Focus model to handle the weight and the ball head will give you all the rotation and angles you need. 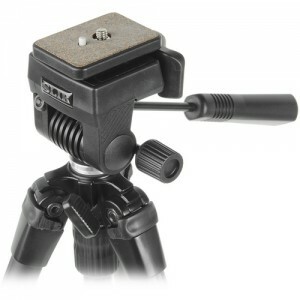 If you want the lowest priced regular tripod with a ‘fluid-effect’ head I like the SLIK Video Sprint II Tripod. It’s very light weight, easy to carry and fairly stable. The head has some smoothing action to it so you can do a pan if you need to. I use an old trick to smooth out pans – get a large rubber band and tie it to the handle. Use the rubber band to pull the pan and it dampens the movement so much you can actually start or end a pan while shooting. I had a SLIK that I loved for years until someone liberated it from me. For $90 it’s hard to beat. 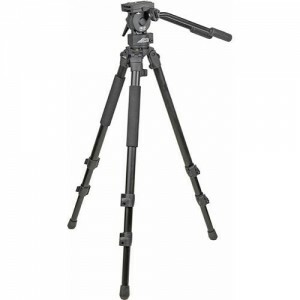 Looking on B&H I found this David & Sanford video tripod with lots of positive reviews at a cost of about $160. 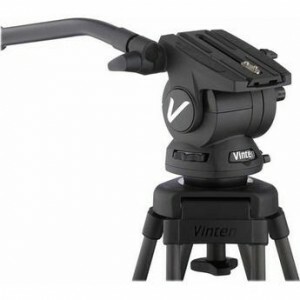 One reviewer called it “the poor man’s Manfrotto.” Another had used several high-end pro tripods and said it performed very well at a much lower cost. I haven’t used it personally but B&H is great about returns so you can see how it works for you. Hey, it even comes with a carrying bag. So, you can lock your DSLR camera for great stable shots without spending hundreds of dollars. You just need something that works for you. What’s your experience? What works for you? PS – have you checked out the Resources section of this site? More good stuff there. Thanks, Carlos, the Libec looks like a sweet system. Check out this link to a new video from Philip Bloom. Look at the shots and the BTS pix. Most of the video clips in this are from a static locked off camera. It depends on what you’re shooting but how much do you really need a great fluid head? There is also this little gem of a fluid head that was brought to my attention by Emm at ChesyCam. Varizooom has a wide price range and is worth looking into. I second Davis and Sanford. But Provista 7518 is better than PROVISTAGR18. Provista 7518 is $20 more but its worth, 7518 is closest to manfrotto models. Malnad – What do you like about the Provista 7518 over the Provista GR18? Thanks – I always prefer a mid-level spreader. It’s much more stable outdoors, just like you said. That would definitely make the 7518 a better choice. Previous post: Editing DSLR Video?